Restoring of a vTiger backup on your account can be required if there is an issue with your website and you would like to reverse the latest changes on your website. Note that when performing this process, your website will reverse to the exact same state, as when you generated the backup you are restoring. The process involves three steps and we will review them thoroughly so you can get a better understanding of how it works. The first step is to upload the files of your vTiger backup to the location, where you would like to restore your website. Note that you need to ensure that the directory is empty and ready for the upload. You can use your favorite FTP client for that purpose. The second step of the process is to restored the database of your vTiger backup. The database must be empty so it is best to create a new one. Once you have a new and empty database, you can proceed with the actual restore. For that purpose, log into your cPanel account and locate the Databases tab. Click on the phpMyAdmin icon. Click on the Import button from the top-menu. In the File Import section, you need to select the dump backup file of the database that you wish to restore. When you complete that, simply click on the Go button at the bottom of the screen. Up until now, you will have a location on your account, which contains all of the files of your vTiger backup.You will also have a database on your account, which has the vTiger backup database restored. To complete the actual restore process, you need to link them together. 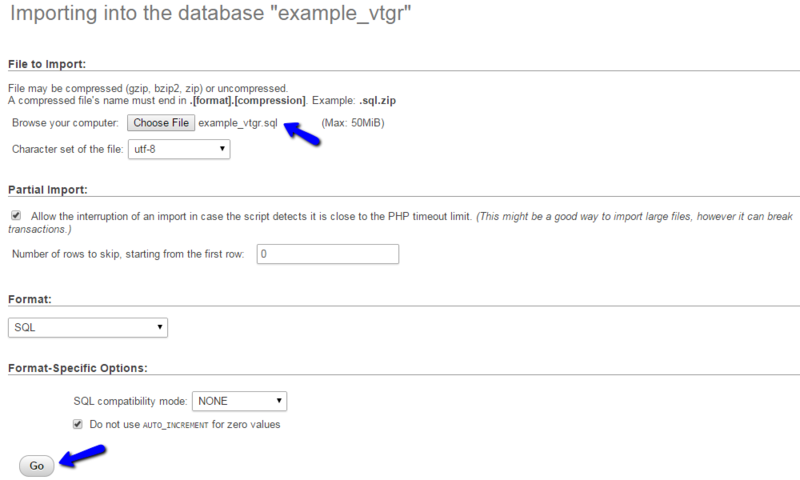 You need to edit the vTiger configuration file and correct the details for your database. The actual changes that you need to make are for the database name, user and password for the newly created database on your account.